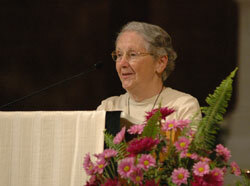 By Sr. Jean Alice McGoff, O.C.D. It is a great joy for me and my community to have gathered with you this evening in the mother church of the Archdiocese of Indianapolis. We are surrounded by a wonderful presence: Archbishop [Daniel M.] Buechlein, who is with us in spirit; Msgr. [Joseph F.] Schaedel, who has supported the transition of our monastery into a seminary since it first emerged as a possibility; members of the clergy, brothers who have presided at our morning liturgies for decades and given us a special sense of the local Church; our sisters and brothers in the various religious communities with whom we have shared visions and practical agendas, joys and sorrows; members of our vibrant and growing secular order of Carmel, who incarnate the Carmelite charism in their everyday lives; brothers and sisters of other Churches and faiths whose wisdom has enlarged our spiritual frontiers; and devoted friends whose support, in a wide variety of ways, has enabled us to maintain our monastery and the prayer life that animates it. In our formative years in Carmel, our sisters opened themselves to the wisdom of two of the greatest mystics in the Church—Teresa of Avila and John of the Cross. We were able, also, to move deeply into the rich doctrinal and liturgical life of our tradition. This broadened out into the vision of the Second Vatican Council. We followed it closely through the Council Daybook and the lectures of Msgr. Ray Bosler, a former chaplain and a peritus for Archbishop [Paul C.] Schulte, at the Council. When I reflected on what I wanted to say tonight, many of the Council’s insights moved into my consciousness. In the end, three of them formed a picture. This third insight was articulated to settle a conflict that emerged at the Council. Some bishops raised the question of the value of contemplative monasteries who made no contribution to the active apostolate. I believe that the third statement is a prophetic one, moving beyond its historical meaning of the presence of canonical contemplative communities, to the contemplative presence of the human person. It ties the universal call to holiness—whose fullness is contemplation—to the universal presence of the Spirit and the Church. The contemplative dimension of the person, when realized, enables one to experience, beyond intellectual concepts, the unity of the human race and the continual, renewing presence of the Spirit of God. This awareness is the root of peace and justice and true stewardship of this beautiful planet. It bears the hope of a true global community. We have tried to live this broadened contemplative understanding of God, Church and world for many decades, and to sow its seeds where we could. It challenged us to balance our life of community and work, prayer, silence and solitude with a contemplative presence to the world. It was our hope to pass this on to a new generation of Carmelites. Instead, we have had Abraham’s experience of standing on the shore of the future. And we have heard in our hearts the promise of something we can only try to imagine. “Count the stars if you can” captures the essence.